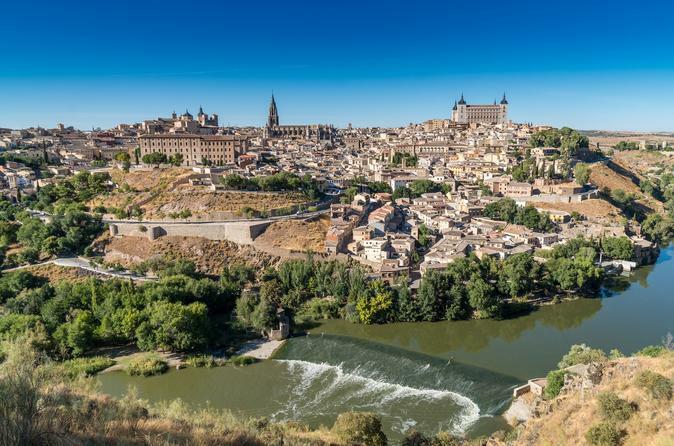 Enjoy a magical day tour to Toledo from Madrid, with entry included to 7 different monuments in Toledo and Cathedral tour (if the option selected), and an expert guide to help you discover the city’s ancient buildings and historic neighborhoods. Embarking in comfort from central Madrid, your expert guide will ensure you visit every essential monument, building and district in Toledo, with guided visits to 3 emblematic sites such as the church of Santo Tomé, the Jewish District and the Synagogue of Santa María La Blanca. In total you will visit the city’s 7 most important historic districts and monuments with fast track entry (3 with guide, and 4 in your own). Also you will be able to visit the Toledo Cathedral with our guide (if option selected). The tour will also include free time (3hrs more or less) for you to explore the rest of the city on your own – with the possibility to return to places already visited or enter freely into further locations with tickets provided by us – including the Church of the Saviour and the Colegio de las Doncellas Nobles. Alternately, if you just want to sat back and enjoy a beer or some lunch on a beautiful terrace, you will also have time to do so and your guide will recommend you some great places, touristic or local.